When its’ time for baking, you will want to have plenty of this homemade vanilla extract on hand for delicious flavor! 8 cups alcohol. You can use vodka, rum, or bourbon for a great flavor. You just really want the uber cheap, “rock gut” stuff because that tends to have a higher alcohol content. Take a sharp knife and slice each bean down the middle. Then, place your sliced beans into the jar, and pour the vodka over. Store in a cool, dry place for 3 weeks before use. You can leave the vanilla beans in the alcohol if you wish and use it that way. As it gets low, you can add more vodka on top of the beans. The flavor may fade a bit, but will still be going strong after several refills. You can also decant the finished vanilla extract into smaller bottles and give as gifts. Want another great way to get vanilla flavor without alcohol? Try making homemade vanilla sugar! Do you make your own extracts? What’s your favorite way to use them? Hi Heather, I love this idea, I’ve been looking for a vanilla extract recipe for some time now, I’ve even bought the Vodka some time ago, in hope of starting this recipe. 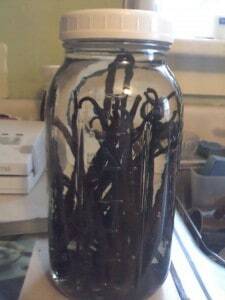 Before I start, I have one question, How long do I need to leave before I have a perfect Vanilla Extract? Thanks a ton! Look forward to your next Post. This is something I have ALWAYS wanted to do, but for some reason it has just never made it to the top of my to-do list.